I have been living in England for four years now and every Thanksgiving we host a drinks party for all our friends and neighbors because I miss the food but we cannot do the real thing just for the two of us. So the canapes are themed around Thanksgiving food, e.g. stuffing balls, squash samosas, turkey and cranberry gougeres, etc. This year we are are going home to the US for Thanksgiving – I miss my family and the food so much! So the drinks party was a little early this year and the canapes were not Thanksgiving themed. After testing out a wide variety of options I have winnowed it down to these seven easy canape recipes for your holiday entertaining. First, because they are delish and second, because they are easy to make ahead and/or assemble last minute so you aren’t spending the entire party in the kitchen cooking up nibbles. These tiny cheese, onion and olive scones are brilliant as well as versatile. You can vary the additional ingredients and seasonings like blue cheese and walnuts, bacon and cheddar, or ham and comte. And this is one that freezes brilliantly. They will need to thaw about an hour before serving. Then you can heat them in a hot oven and serve whole or split them open and spread on a bit of herbed butter. Make these delicious scones in advance and freeze them so you always have nibbles for drinks! Step 1 Preheat the oven to 400 F. Lightly butter a baking sheet. Step 2 Sauté the onion in a little butter or oil on low heat until translucent. Raise the heat to medium and cook until it is slightly brown and darkened around the edges but not burnt, about 5-7 minutes. Remove from the pan and set aside with the olives. Step 3 In a large bowl or mixer with a paddle attachment, stir together the flour, baking powder, salt, smoked paprika and mustard powder. Add the cheddar cheese and mix until combined. Distribute the butter over the flour mixture and combine until it resembles coarse crumbs. Use a pastry blender or your hands if not using a mixer. Step 4 In a small bowl, stir together the milk, 1 egg and the onions and olives. Add the milk mixture to the flour mixture and stir until combine. Step 5 Spread the dough into an 8-inch-diameter circle in the center of the prepared baking sheet, or drop by tablespoons to form 8-10 separate scones. Brush with the egg glaze on top and sprinkle with the grated parmesan. If making the 8 inch round circle, with a serrated knife cut 8 wedges not completely through to the bottom of the pan so that the scone cake is easier to serve. Step 6 Bake for 15 – 17 minutes until the top is lightly browned and a cake tester or toothpick inserted into the center of a scone comes out clean. The individual scones will take the lesser amount of time to cook. 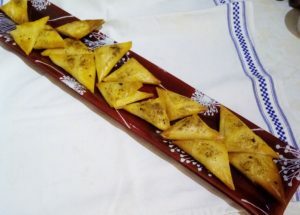 The squash Samosas are a big favorite. Made with filo/phyllo dough and Harissa spice they are another make ahead and reheat before serving item. Working with the filo/phyllo dough takes a bit of practice but it is rather forgiving in this format and after a few tries it is really assembly line easy. The squash is given a good kick with Harissa Spice making these a favorite for drinks parties. You can make a few days in advance and reheat at the last minute. Step 1 Preheat the oven to 425 F. Cover a baking sheet with foil and brush lightly with olive oil. Cut the squash in half, scoop out the seeds and stringy membranes, brush the cut side with olive oil and lay cut side down on the foil-covered baking sheet. Bake 40 minutes or until soft enough to pierce easily with a knife. Remove from the heat and allow to cool, then scoop the flesh into a bowl and mash with a fork or puree in a food processor. Stir in the lemon or lime juice and the 1 tablespoons of butter. Step 2 Grate the cloves of garlic into the squash mixture and add the spices. Whiz again in the food processor or stir to combine. Taste and adjust seasonings. Chill for an hour or overnight in the fridge. Step 3 Preheat oven to 375 F line a 9×11 baking pan with baking parchment. Open out the phyllo pastry and, when not using it, keep it covered with a slightly damp dish towel so that it doesn’t dry out. Cut the pastry into strips approximately 2 inches wide – you should have 6-8 piles of layered pastry. Return all but one pile of layered pastry to the damp towel. Remove one layer of pastry from the pile and spread it on a smooth surface or cutting board. Dip the pastry brush in the melted butter and brush the pastry so that it is covered in a light film of butter. 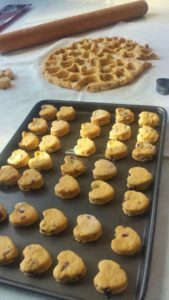 With the pastry perpendicular to the edge of the surface or cutting board, place a small amount (size of a penny) of the squash filling in the center approximately 1 inch from the lower edge. Take the right-hand corner of the pastry and fold it up diagonally across the squash to form a triangle. Fold the triangle over its top edge and then over its long edge. Continue folding the pastry in a triangle until you have reached the end of the strip (like folding a flag). Brush both sides with butter and place on the prepared baking pan. 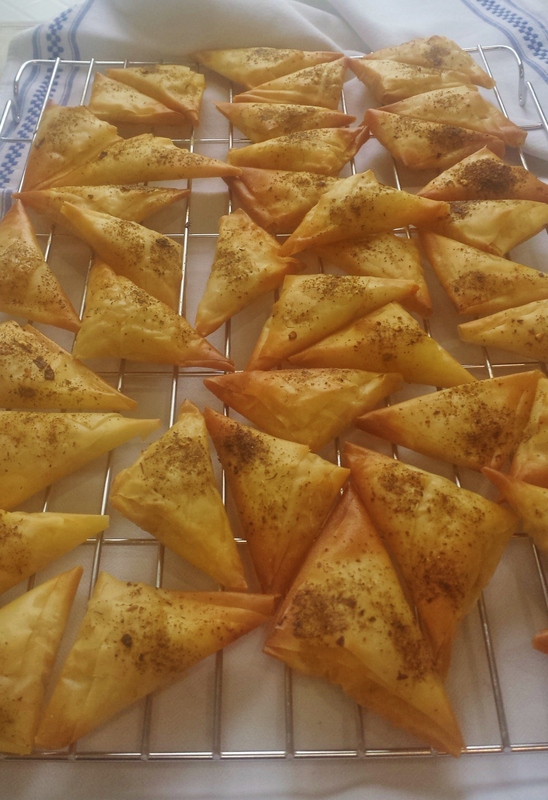 Step 4 When you have filled the sheet with samosas bake for 8-10 minutes. Remove to a cooling rack. They can be made up to a day ahead and gently reheated before serving. Chorizo, manchego and quince paste is a wonderful combination on a stick. The chorizo should be the aged type, not the kind you need to cook, and the quince paste can usually be found in specialty stores or, if you have a quince tree as my neighbor here does, you can make your own pickled quince which is a lovely sharp alternative to the sweet quince paste! A fantastic combination to slide onto a cocktail stick: spicy chorizo, mellow manchego and quirky quince. Add a bit of a kick with our recipe for Pickled Quince - you'll find lots of uses for it in sandwiches, with cheese, just use it like a pickle!! Step 1 Slice the chorizo into 25-30 thin slices. Cut the Manchego and Quince Paste into the same number of cubes. Step 2 Fold the chorizo in half and thread onto a toothpick with the cheese and quince in the center. Quince is a cousin to the apple but cannot be eaten raw. Pickled in this way it retains its elusive flavor while also packing a pickled punch! Use it with cold beef or ham, sandwiches or anywhere you would like a pickle! Step 1 Pour the vinegar into a stainless-steel pan. Add the sugar, juniper berries, peppercorns and bay leaf. Bring to the boil then turn the heat down to a simmer. Step 2 Peel, halve and core the quinces, cutting them into six lengthwise sections. Add the quince to the simmering vinegar and leave to cook for 15 – 25 minutes, until soft enough to pierce effortlessly with a knife. Step 3 Lift the soft fruit out and place them in clean storage jars. Pour the pickling liquid over, seal and leave to cool They will keep for several weeks refrigerated. The chicken liver pate recipe is lifted almost exactly from Mastering the Art of French Cooking and can be made a week in advance. You will need to buy little canape cups to serve it in or you can fry rounds of stale sourdough bread for a really delicious crunch! 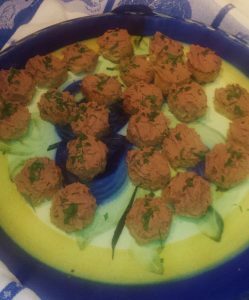 If you are using the canape cups don’t fill them until just before you are going to pass them around because as I learned the hard way the cups will go soggy if you make them in advance. A luscious but light mousse that is easy to make and will impress your friends! Serve on toast or even better, fried bread! Step 1 Cut the livers in ½ inch pieces. Step 2 Add the 2 tablespoons of butter to a sauté pan and when the butter has foamed add the shallots and livers. Sauté for 2-3 minutes until the livers are just stiffened, but still rosy inside. Scrape the contents of the pan into a blender or food processor. Step 3 Pour the madeira or cognac into the same sauté pan and boil down rapidly until is has reduced to 3 tablespoons. Add this to the livers in the blender. Step 4 Add the cream and seasonings to the liver mixture. Cover and blend at top speed for several seconds until the mixture is a smooth paste. Taste and correct seasoning it will probably need salt and pepper and may need a shot or two of cognac. Force the mixture through a sieve and pack into a decorative bowl or terrine. Cover with waxed paper or plastic wrap and chill for 2-3 hours. Step 5 The pate will keep for up to two weeks in the fridge. 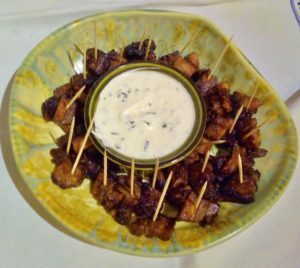 Any excuse to serve pork belly is valid in my book and these nuggets cooked in a bourbon bbq sauce are award winners on their own or served with a sour cream and chive dipping sauce. Depending on how many people and how cramped the party I sometimes opt out of serving side sauces – too complicated – but this one is a really nice complement to the rich pork belly. Who doesn't love Pork Belly with Crackling Crisp Skin??? You can cook the pork belly the day before for 3 hours in a low oven. Then finish off the day of your party in just 30 minutes. It's a Wow!! Step 1 Heat oven to 300 F. Pour ½ cup of the bourbon into a small, shallow roasting tin or casserole and add the star anise. Salt and pepper the pork belly and place in the tin rind-side up. Cover tightly with foil and bake for 3 hours. Remove from the oven and leave to cool for at least 1 hour. You can chill the pork for up to 2 days at this stage. Step 2 Heat oven to 400 F. Remove the pork from the tin. Using a small, sharp knife pare away the rind from the meat, leaving a small layer of fat. Cut the meat into 1 inch chunks and the rind into strips about ½ inch wide and 4-6 inches long. Return everything to the tin and roast for 20 minutes until crisp and sizzling, turning regularly. Step 3 Meanwhile, tip the ketchup, soy sauce, hone and remaining ½ cup of bourbon into a small pan. Set over high heat and bubble for 5 minutes until thick and syrupy. Step 4 Remove the pork belly chunks and crackling strips from the roasting tin. Set aside the crackling strips to drain on a piece of kitchen towel. Place the pork belly chunks in ceramic oven proof baking dish. Pour the bourbon mixture over and roast for 10 minutes more until sticky. Step 5 Snip the chives into the sour cream and serve alongside the Pork Belly bites. Serve the cracklings separately. The Stuffing Balls (or Force Meat Balls as they are called in England) can also be made and cooked in advance, then heated briefly before serving with a spicy dipping sauce. Another make ahead delicious nibble. A spicy chutney or red pepper jelly really makes the flavor pop. Step 1 Preheat oven to 450 F.
Step 4 Line a baking sheet, or two, with foil and lightly grease the foil. 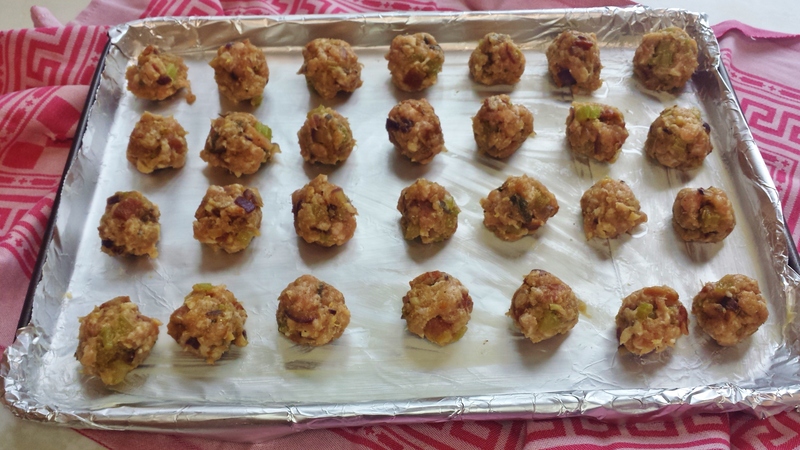 Using a small teaspoon roll the mixture into rough balls and place them on the prepared pan. Cook for 20-30 minutes until golden crisp. Can be refrigerated for up to 1 week. Reheat on medium heat and serve with a spicy chutney or red pepper jelly. 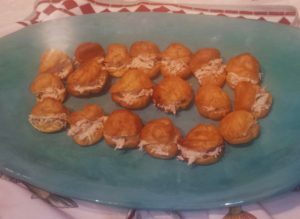 The crab served with grapefruity mayonnaise on gougeres is my alternative to the prosaic smoked salmon with cream cheese. You can make the gougeres well in advance and freeze them. Then just pop them in the oven at 350F for 2-3 minutes and let them cool before filling with the crab mixture. If you can get fresh crab meat this is such an easy nibble and the reduced grapefruit juice really highlights the sweetness of the crab. Serve in canape cups or see the recipe for gougeres. Step 1 Squeeze the grapefruit juice into a saucepan and bring to the boil. Simmer gently until reduced by half, 15 – 20 minutes. Step 2 Remove from the heat and leave to cool. Step 3 Mix the crab meat, mayonnaise, parsley and cayenne pepper together. Add the reduced grapefruit juice to taste. Mix thoroughly and taste for seasoning. Step 4 Serve on gougeres* or in canape cups. Pate a choux pastry is easy to make and once you have tried it gougeres will be your go-to recipe for canapes. If you want to serve the gougere on their own add grated cheddar or even blue cheese to the batter. If you don't have a pastry bag use a heavy duty zip lock baggie and snip off the bottom corner of the bag. Step 1 Bring the water to a boil with the butter and seasonings in a heavy bottomed saucepan, until the butter has melted. Step 2 Remove from heat and immediately pour in all the flour at once. Beat vigorously with a wooden spoon for a few seconds to blend thoroughly. Return to moderate heat and continue beating for 1-2 minutes until mixture leaves the sides of the pan, forms and mass and begins to film the bottom of the pan. Step 3 Remove from heat, make a well in the center of the paste with your spoon. Break an egg into the center of the well. Beat it into the paste for several seconds until is has absorbed. Continue with the rest of the eggs, one at a time. The third and fourth eggs will be absorbed more slowly. They were delicious down to the last bite!